How much of the sky can the JWST see? To turn and point at different objects in space, Webb uses six reaction wheels to rotate the observatory. The reaction wheels are basically flywheels, which store angular momentum. The effect of angular momentum is familiar in bicycle riding. It is much easier to stay up on the bike when it is moving than when it is standing still, and the bicycle will tend to go straight in 'no hands' mode thanks to the angular momentum of the spinning wheels. Slowing down or speeding up one or more of the Webb's reaction wheels alters the total angular momentum of the whole observatory and consequently the observatory turns to conserve angular momentum. Hubble uses reaction wheels also to turn to point at different objects. The reaction wheels work in combination with three star trackers and six gyroscopes that provide feedback on where the observatory is pointing and how fast it is turning. This enables coarse pointing sufficient to keep the solar array pointed at the Sun and the high-gain antenna pointed at the Earth. To take images and spectra of astronomical targets (i.e., galaxy, star, planet, etc.) finer pointing is needed. Additional information for finer pointing from the Fine Guidance Sensor in Webb's integrated science instrument module (ISIM) is used to move the telescope's fine steering mirror (FSM) to steady the beam of light coming from the telescope and going into the science instruments. Webb's reaction wheels, star trackers, gyroscopes, Fine Guidance Sensor, and fine steering mirror work together in the observatory's attitude control system (ACS) to precisely point and stare at targets so that the science instruments can see them and see them clearly. The system works much the same way your body uses multiple methods of differing precision ("your inner ears and eyes and nervous system and muscles") to catch a baseball in the outfield. To me, this implies the JWST's mirrors are rigidly attached to the base of the spacecraft, so they're in a fixed orientation. The telescope always looks in a plane roughly parallel to the sunshield. 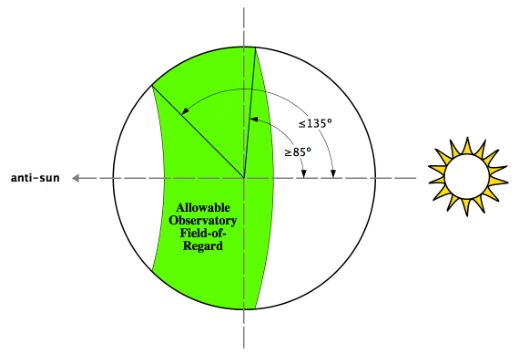 Because the sunshield has to be normal to the Sun (more or less), that limits the field of view available at any one time to a circular strip of the sky. If you wanted to look at a particular star, you'd have to wait for up to 6 months for it to become available. That seems too long for many interesting transient phenomena. The key here is the 'more or less' part: how far out of the normal can you tilt the JWST without losing the sunshield's effectiveness? How much of the sky can the JWST observe from any given position in its orbit? At any particular location JWST will always be able to tilt sideways clock or counter-clockwise. It however cannot tilt backwards, due to the constraints of the sunshield facing the sun. As the field-of-view is essentially all-sky on average JWST will be used as follow-up for many surveys, in particular to characterize non-transient phenomena in detail. Transient phenomena like Gamma-ray bursts or transiting Exoplanets will be hard to discover by JWST if they're not luckily in the viewing horizon at any given moment. A last piece of knowledge that is necessary to understand this map, is that the map only represents the possibility of looking at things for the given amount of time. JWST's instruments have fields of view of $2'\times 2'$ and smaller, so the time allocation committee has additionally to actually decide to look at an object when being in the viewing horizon. This again emphasizes JWST's character as follow-up rather than discovery-machine: The coolant will run out after approx. 5 years with no means of refuelling at L2, so in any particular moment the viewing horizon observation time is expected to be heavily overbooked with known objects, leaving little time for 'just poking around in the darkness'. The field of regard (FOR) is the region of the sky in which observations can be conducted safely at any time. For JWST, the FOR is a large annulus that is centered on the position of the Sun. The FOR, as is shown in Figure 4-14, allows one to observe targets between 85° and 135° off the Sun line (MR-103, MR-104, MR-105). 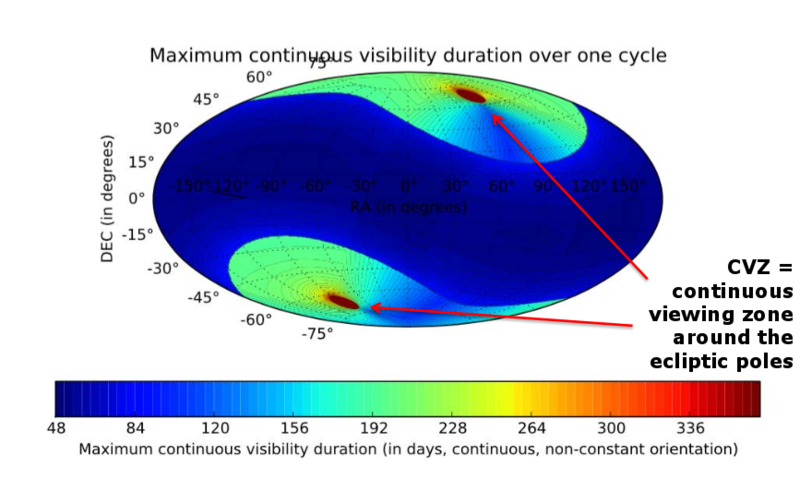 Most astronomical targets are observable for two periods separated by 6 months during each year. The length of the observing window varies with ecliptic latitude, and targets within 5 ° of the ecliptic poles are visible continuously (MR-106). This continuous viewing zone is important both for some science programs that involve monitoring throughout the year and will also be useful for calibration purposes. The sunshield for JWST will provide a 39.7% celestial field-of- regard (FOR) that is greater than the sky coverage requirement of 35% (MR-104). This large FOR is required to provide the scheduling flexibility to allow JWST to conduct an efficient scientific program and simplifies orbit station-keeping design since it permits a wide range of Sun orientations for thruster firing. Not the answer you're looking for? Browse other questions tagged james-webb-telescope or ask your own question. The JWST - What happens if/when it breaks? Does the JWST have a camera to monitor its deployment progress? How will JWST be serviced? How can the 6.5 m primary mirror of the JWST fit inside the 5.4 m fairing of Ariane 5? Can the James Webb Space Telescope basically manage its own orbit if necessary? Why isn't the JWST mirror bigger? How much would the James Webb Telescope have cost of they made two or ten of them instead for example? 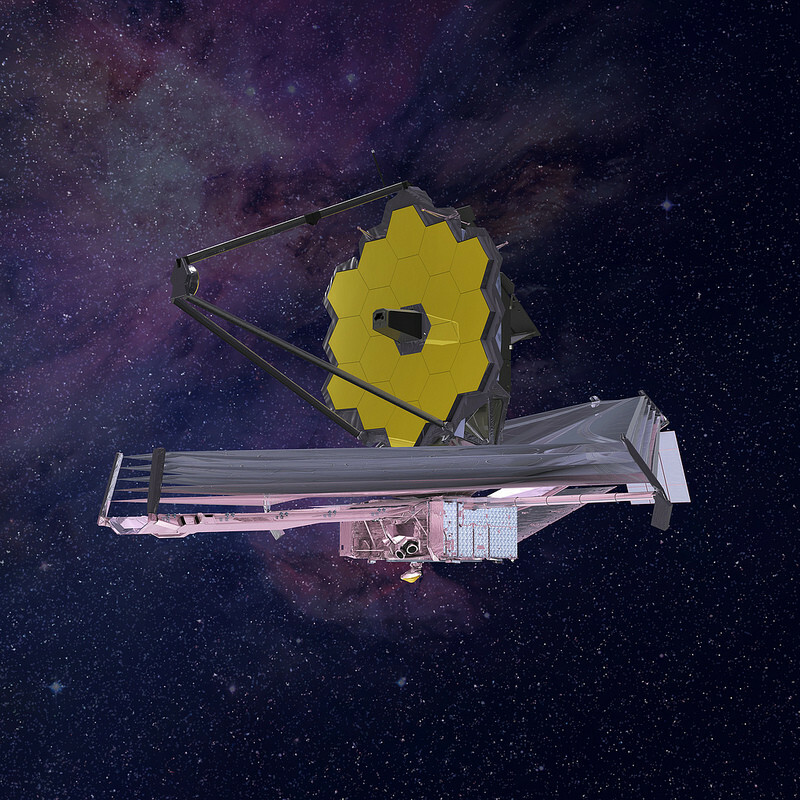 Can/Will the James Webb Telescope maintain its position passively?